The BLACK & DECKER GH900 String Trimmer is among the bestselling trimmers available on the market today. Unlike other cordless trimmers, this one requires an electrical cord to operate. Depending on your choice, one can either use the 14-gauge or the 16-gauge extension with the available 100-foot cord with a two-prong connection. When it comes to assembly, most customers appreciate the simple five-minute setup where you’re required to mount the auxiliary handle onto the shaft. The handle is adjustable in several different heights to suit customers from five to six feet tall. Speaking of the trimming performance, the BLACK & DECKER GH900 String Trimmer comes with smart-edge technology that allows it to trim tight edges without losing control. This trimmer comes with a wheel and a smart speed control setting that allows you to trim the edges accurately. Finally, this trimmer is powered by a strong, six-amp motor that allows the 0.065” string to cut any weeds regardless of the height and strength. 5-amp motor—this trimmer is fitted with a very powerful 6.5-amp motor that gives it a higher power rating to perform all your trimming duties. Extension cord holder—another smart feature is the extension cord holder. This holder prevents the cord from unplugging when the trimmer is in operation. All you have to do is fold the cord then hook it onto the holder to keep it intact. Easy assembly—when it comes to the assembly, this trimmer is very easy to put together. With the help of the user manual, all you have to do is to attach the handle to the shaft. The handle is adjustable, making it perfect for both tall and short customers. This trimmer is very easy to assemble. The powerful 6.5-amp motor allows this trimmer to cut tough weeds in just a fraction of the time. The smart-edge technology allows this trimmer to function as an edger. The long extension cord allows this unit to reach every corner of your yard without any limitations. Some customers have mentioned that the handle is unable to support the weight of the trimmer. The powerful motor means that you’ll have to use too much line. This again means that you’ll have to open the container and re-feed the line more often. The BLACK & DECKER GH900 String Trimmer is a high-quality trimmer that does a great job of trimming your entire yard in a fraction of the time it normally takes. Designed with quality features such as a powerful motor, an adjustable handle, and a long string, this unit is capable of accomplishing all trimming tasks without performing any errors. However, one setback that every customer really complained about was the auto feeding system that consumes a lot of line when trimming. All in all, this trimmer is a bestseller and the best on the market so far. The BLACK & DECKER GH900 String Trimmer is among the best when it comes to keeping your backyard tidy and free from overgrown weeds. However, we opted to compare two more trimmers from the competition to give customers a chance to compare the features and the price range before making their final decision. One of the string trimmers we compared was the BLACK+DECKER LST201 20V MAX Lithium-Ion String Trimmer/Edger, 10″. Powered by a 20-volt, 1.5 Ah Lithium-ion battery, this trimmer is capable of handling most cutting tasks without backing off. This unit is designed with an automatic feed spool (AFS) that feeds the 10” cutting line when needed. Its light weight of 4.5 pounds, adjustable handle, and battery life that goes up to 18 months make this trimmer among the best on the market. Next, we compared the GreenWorks 21212 4Amp 13-Inch Corded String Trimmer. 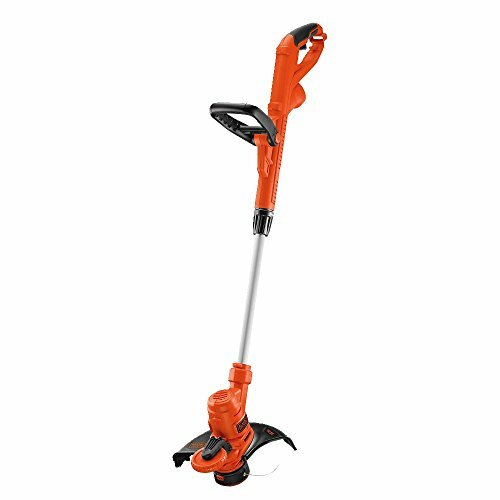 A light weed trimmer that weighs just seven pounds, this unit features a 13” cutting path with a dual auto feeding line and an adjustable handle. Build to last, this trimmer has zero carbon emissions and has been welcomed with a company warranty of four years to boost customers’ purchasing power. After a thorough review of the three weed eaters in terms of the features, technologies used, and the cost, the BLACK & DECKER GH900 String Trimmer was our overall winner. Constructed with a 100-foot, two-pronged cord, this trimmer is easy to set up and the best at accomplishing difficult trimming tasks. The adjustable handle and the simple operating mechanism offered by this trimmer are among the factors that allowed it to achieve the top spot. In the runner-up position, we placed the BLACK+DECKER LST201 20V MAX Lithium Ion String Trimmer. Powered by a 20-volt, 1.5 Ah battery, this trimmer is capable of handling most cutting tasks without backing off. This unit is designed with an automatic feed spool (AFS) that feeds the 10” cutting line when needed. This trimmer could have seen the top spot, but it missed out because it uses batteries, making it less powerful and reliable than the BLACK & DECKER GH900. Last but not least, we reviewed the GreenWorks 21212 4Amp 13-Inch Corded String Trimmer. A light weed trimmer that weighs just seven pounds, this unit features a 13” cutting path with a dual auto feeding line and an adjustable handle. Build to last, this trimmer has zero carbon emissions and is the perfect option for customers looking for a cheap but responsive weed eater to accomplish various cutting tasks.